Peter G. Beidler’s newest work is a slice of history from the American Civil War, as revealed in the letters of his great grandfather, William Cross Hazelton. 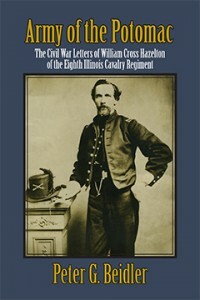 Army of the Potomac: The Civil War Letters of William Cross Hazelton of the Eighth Illinois Cavalry Regiment (IBSN: 978-1-60381-001-2, 242 pages, $13.95) is an absorbing mix of love letters, historical context, and photographs featuring a man of compassion, humor, and startlingly contemporary moral sensibilities. Army of the Potomac was a finalist in the 2013 Next Generation Indie Book Awards. William Cross Hazelton spent four years as a brave and devoted member of the Union cavalry in the Civil War. During that time he corresponded with Fannie Morrill, the young woman who would become his fiancée and eventually his wife. His letters describe the life of an Illinois volunteer in the Army of the Potomac, the military unit that fought Lee’s Army of Northern Virginia in most of the big battles of the Civil War: Williamsburg, Richmond, Antietam, Fredericksburg, Chancellorsville, and Gettysburg. Hazelton describes the battles from the viewpoint of an ordinary cavalryman slogging through the mud, following erratic orders, surviving for days on enemy turf eating nothing but hardtack, and wondering why the Union army, though superior in numbers and supplies, kept losing battles. After Lee surrendered and Lincoln was assassinated, Hazelton became part of the cavalry posse that chased John Wilkes Booth across the Potomac. His letters breathe new life into a war so devastating that it still scars the American psyche, while exhibiting a moral perspective far ahead of its time. PETER G. BEIDLER, retired professor of English at Lehigh University and the great-grandson of William Cross Hazelton, has painstakingly researched the historical background of Hazelton’s letters to clarify now-obscure references and explain what Hazelton left out in order to shield his future wife. BEIDLER has published many books and articles and won several teaching awards. Several books that Beidler either wrote or edited are published by Coffeetown Press: Chaucer’s Canterbury Comedies: Origins and Originality, The Collier’s Weekly Version of Henry James’s Turn of the Screw, A Reader’s Companion to Salinger’s Catcher in the Rye, Second Edition, Risk Teaching: Reflections from Inside and Outside the Classroom, The Roving Bee: A Peep into Many Hives, Self-Reliance, Inc., A Student Guide to Chaucer’s Middle English, Writing Matters. Our forces have evacuated Fredericksburg and we are again on the north side of the Rappahannock. What is to be done now I have no idea. I apprehend that the “good people at home” will find that others fail of their purpose besides McClellan. I would not be surprised if that General was again called to the command of the Army of the Potomac. If the “Gentlemen” at home who are crying “Forward to Richmond” will come into the field with their muskets we will go forward with them. Yes, more, we will take the front; but while they remain at home don’t let them drive our Generals into attempting that which they cannot perform, thus sacrificing the lives of their soldiers. Life is as dear to us as to them, and though we have placed our lives at the disposal of our Country, we do not like to be pushed on by those who never saw a battle. But I am a little out of tune to-day. You will excuse this I think when I tell you I had only half a night’s sleep, and that on a pile of boards with my overcoat on.